I was in a testosterone fog. Like the tops of the eastern Kentucky hills hidden by the fog of this particular winter, rainy, day, my judgement was clouded by the current state of my machismo. My bravado gauge seemed to be in sync with the RPM gauge on my Fiat X 1/9, both maintaining a level above what could be considered safe at the time. You get the picture. I had my new girlfriend, now my lovely wife of 29-plus years, sitting in the orange leather passenger seat of this Italian classic sports car (description may be an embellishment). Our destination was Ezel, Ky. I had invited her to come with me for her first trip to Morgan County, my home, to witness her new boyfriend perform the most manly of courtship rituals. Amid all of the Animal Planet and Nature Channel shows that focus on the singing, dancing, spreading plumage, and so forth found in nature, there is one facet of the male-to-female attraction ritual that never seems to be shown…the male’s invitation to the female to travel a long distance to watch him play in a basketball tournament in a small rural gymnasium. As if her femaleness wasn’t clicking on all cylinders in the anticipation of watching me display my prowess on the court of the old Ezel High School gym, added to her delight was riding in a car that barely had the weight to stay within the gravitational pull of the planet at 70 mph. Not only that, but throw into her experience a driving rain and road spray coming onto a vehicle that wasn’t as tall as the semi trucks’ tires I kept passing. The six-inch Italian wiperblades could not keep the amount of water cleared off the windshield long enough to see the small ponds formed on the rain-soaked Mountain Parkway. I assumed each episode of hydroplaning that showcased my daring-do car handling ability would further add to her confidence in opting for my affections. I was thinking none of her past beaus would have been able to deliver an unprecedented afternoon such as this. Ezel is a beautiful section of rolling hills and farmland in western Morgan County. 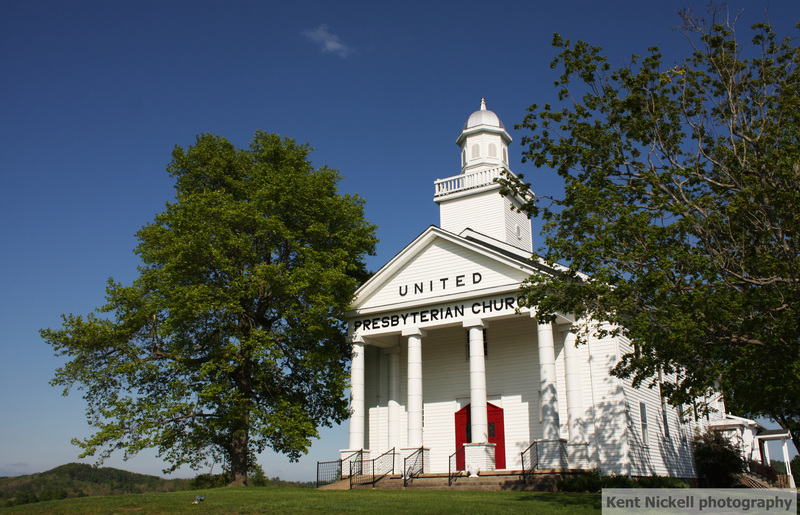 Sitting atop one of these rolling hills is the Ezel Presbyterian Church. It is one of my favorite sights in all of Morgan County. This church building was built about ninety years ago. Remarkably, my wife still continued to date me after this inglorious day. Although since this day, when we travel there is a constant update on weather changes and road conditions and speed monitoring coming from the passenger seat. Also my team made it to the finals of the basketball tournament that day so my lucky new girlfriend was able to be impressed by my manliness for a whole day in that gym at Ezel. We lost in that game, but not before I was able to keep my man from missing a shot and holding him to about thirty points. I am happily married today because my wife never understood the fundamentals of a man-to-man defense.